Painted during two periods near the end of Aulerich-Sugai’s life, the reverent imagery in the Figures series offer a pensive and introspective take on representation. While painted in groups, the figures are unaware of one another; large portions of their bodies are left unpainted, blending with the surrounding negative space. For the earlier body of work in 1990 and 1991, models would come twice a week for several months, and take quiet, inward, and contemplative poses. Aulerich-Sugai described the ascending figures as “bodies to grow into.” Other works show figures in repose. Painted following the death of three close friends, including a former lover, these works channel the artist’s grief. 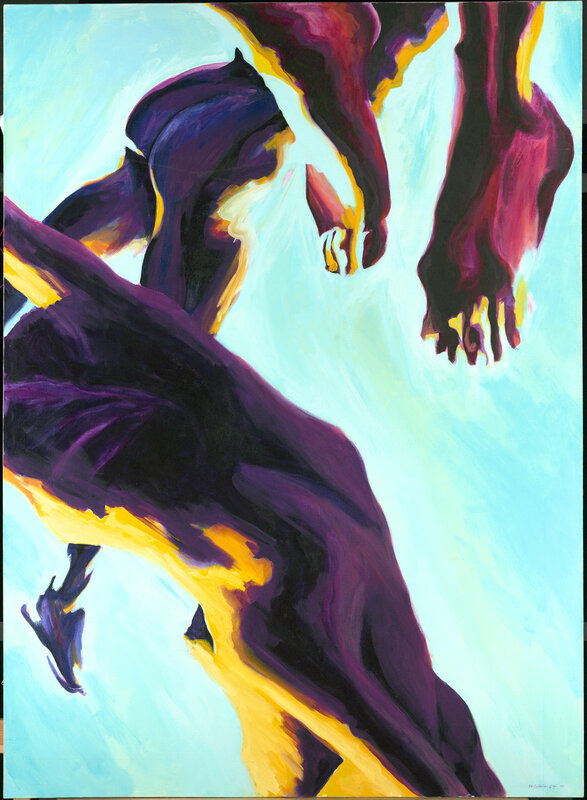 The later works, completed in 1993, use a more saturated palette to represent bodies suspended weightlessly in space.